I’ve started reading some libertarian-leaning books lately and this is one of them. It’s a little dense at times—even though I assume it was written for the lay public—going into some detail about the constitutional arguments surrounding a dozen or so historic Supreme Court decisions or Presidential actions. In many ways, it was a good history lesson for me, but more fundamentally, it left me asking a very specific question. 2. The “Federalists,” who thought the government in Washington should be a federal one, with only a specified set of powers granted it by the states. …and the Constitution was ratified by the states with that express purpose in mind. And today, in fact, the Constitution still reads this way. It lists the limited powers that the federal government has and, expressly in Article Ten of the Bill of Rights, says that all powers not explicitly stated are reserved to the states. But that is not how we interpret the Constitution today. Today, we have a much more “nationalistic” perspective, and Woods and Gutzman’s book is a catalog of the major steps that took us along that path. 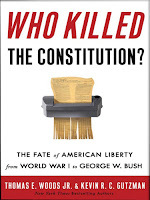 There are several examples of presidential power expanding beyond the letter of the Constitution—Roosevelt confiscating gold, Truman seizing the steel mills, Bush’s policy on the unitary executive during wartime—but so are there examples of the Supreme Court expanding the scope of Federal power through (according to the authors) unconstitutional decisions. Desegregating and banning organized prayer in the public schools both fit into this category and, I have to admit, their arguments for the unconstitutionality of these decisions are logically sound, as much as we (and even the authors) might support the intent behind them. And that, I think, is the key idea. It’s human nature. If you want to do things badly enough, you inevitably find ways to get them done, regardless of any rules that have been written to prohibit them—especially if you are the one responsible for interpreting the rules. The authors credit Thomas Jefferson with first making this observation with regard to the American experiment. He knew that if the federal government had a monopoly on constitutional interpretation, it would naturally read the Constitution in its own favor, always announcing that it had discovered in the text yet more power that it could exercise. He insisted that the states, twelve of whose delegates had drafted the Constitution, and all of which by 1790 had ratified it, were entitled to make ultimate constitutional determinations, because the only alternative was a central government monopoly that in the end would swallow up the states. This is where things stand today. There are some fledgling “Tenth Amendment” movements that are gaining some ground—most notably with regard to what states want to do with medical marijuana and their clashes with federal drug policy—but we are largely a nation with a monopoly on power at the federal level. I’m not ready to say that’s either good or bad, but it does make one of the authors’ closing paragraphs much more compelling. 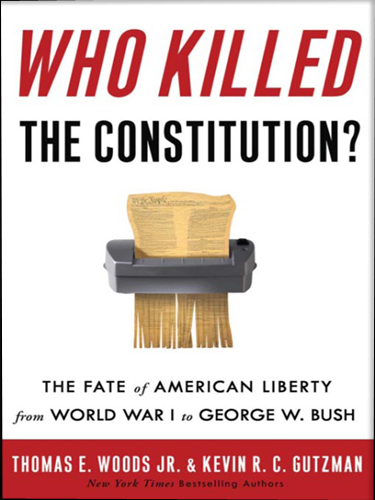 It is perhaps jarring to consider the possibility that constitutions are destined to fail. After all, we are indoctrinated from early childhood with the idea that the Constitution is the font of our liberties—even though Americans were free before it was written. And it is to the U.S. Constitution that every government official still swears his fidelity. But when we look beyond the grand rhetoric to the actual record, we must confront a troubling conclusion: once an institution obtains supreme force, it is probably utopian to expect its powers to remain limited over time—especially when the one thing doing the limiting is a document that is interpreted and enforced by the very institution it is supposed to restrain. So again, I ask. Is nationalism inevitable? Yes, once you surrender any measure of authority. Thanks, Cathy. How is one to live without surrendering any measure of authority? You cannot be "free" and "non-free" at the same time. You must choose, and in so choosing seal your fate. What does it mean to "choose" to be free?